If you’ve hung around me long enough to hear me talk about my philosophy regarding book reading, you’ve probably, at some point, heard me talk about my belief in the importance of reading a book when the mood strikes as opposed to arbitrarily reading it. Something I don’t really talk about much, but that I actually think is far better than reading when the mood strikes, is reading a book when you feel it’s an absolute necessity to read–i.e., when you’re in a sea of despair or confusion or in the darkness and something draws you to a particular book and seems to say that it just might contain a lifeline or a light to help you find the truth, or wisdom, or consolation, or comfort, or faith, or the answer that you need at that moment. Sometimes, one passage at the right time is enough to resuscitate. I guess the reason I don’t usually include “reading out of necessity” in my philosophy about reading is because, the times that I find myself reading out of necessity are, for the most part, times that I really wouldn’t wish on anyone. The finding a lifeline part is great, the feeling like you’re drowning part not so much. I’ve had a pretty rough month and a nightmare of a last week. It’s been difficult to find something I’m in the mood to read, because, really, I haven’t been in the mood to read anything. But read: I must. So I’ve been giving a lot of thought to what would be good for me to read right now. 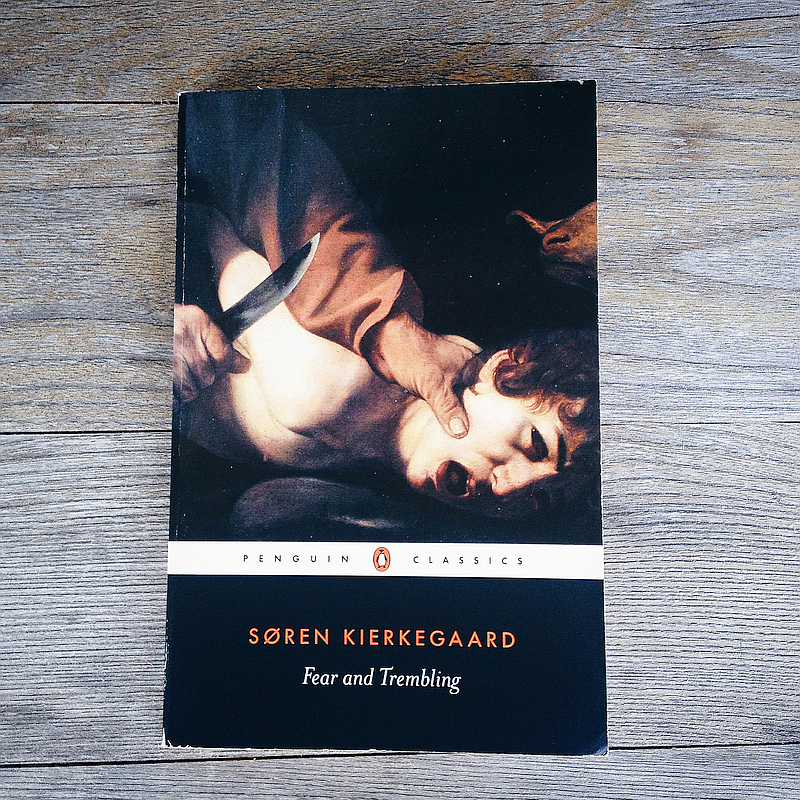 I think I found my answer last night, when I suddenly felt it was incumbent on me to read Soren Kierkegaard’s Fear and Trembling. It isn’t too surprising as, lately, I’ve been thinking a lot about sacrifice and faith. I’ve also been feeling a lot like Abraham being asked to sacrifice Isaac, trying not to look at the horror of the thing, but instead trying to hold on to the faith and belief that it’s the right thing to do and that somehow it will all work out for the best. I don’t know how Abraham did it. My sacrifice seems to make far more sense and, yet, half the time, having faith that “all manner of thing shall be well” still feels impossible. But all that to say, if ever there were a perfect time for me to read this book, that time would probably be now. This actually isn’t the first time I’ve tried to read Fear and Trembling. In early 2014 I started reading it, but I skipped the 30 page introduction and jumped right in. That was probably a mistake, as I didn’t really understand what Kierkegaard was doing and what he was trying to say and I ran out of motivation to continue reading after about twenty pages. It was also probably just a matter of it not being the right timing too. I was pretty comfortable with my life and not being asked to make any leaps of faith or momentous sacrifices at the time. I came at it from a place of intellectual curiosity, but definitely not out of necessity. Right now, though, it feels like a necessity. I’ve gotten twenty pages into the introduction, today, and, so far, everything I’ve read has confirmed that this is the perfect paper path for me to tread at this moment. I’ve also found myself thinking that this might be a good book to blog about, so I’m gonna try that, but I make no promises. I’ve tried to do this in the past, alas, so far, without success. Hopefully, this time around, I’ll be more successful. I guess time will tell.